When the founder of Ruby Tuesday, Sandy Beall, was reviewing some early designs of printed materials for his planned restaurant, he saw that some of the art featured the faces of University of Tennessee students printed in red. At that moment Sandy knew he wanted to call the eatery "ruby something." Meanwhile, he and the four fraternity friends who joined him in the investment had been listening to lots of Rolling Stones music. One day when Sandy heard "Ruby Tuesday" come on the jukebox, he convinced his partners that they had finally found a name. 1. Prepare the barbecue or preheat the stovetop grill. 2. Rub a little oil on the chicken, then sprinkle some salt, thyme, and savory on each chicken breast. 3. Grill the chicken on a hot grill for 4 to 5 minutes per side, starting with the skin side down. When you flip the chicken over, wait a couple minutes, then put the slices of ham on the grill. This is just to heat up the ham. Be careful not to scorch it. 4. When you think the chicken is about a minute away from being done, brush 1 tablespoon of barbecue sauce over the entire face-up surface of the chicken. 5. Stack 2 slices of ham on each breast, then lay a slice of provolone on top. 6. Grill the chicken until the cheese has melted, then remove the breast from the heat. 7. 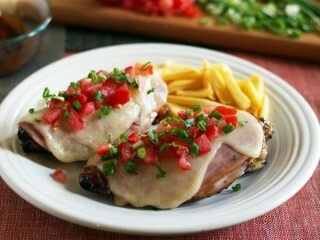 Serve each chicken breast topped with 2 tablespoons of the tomatoes and a tablespoon of green onion. Serve immediately with a side of French fries or rice, if desired. The recipe is excellent, however, I would brine the chicken beforehand (brine; 1-cup buttermilk + 1-tablespoon salt in zip lock bag for at least 1-hour in frig,rinse breast off and pat dry and it's ready to go for a moist and tender chicken.) Then follow directions. Great BBQ sit-down !